The Nasdaq Dividend Achievers™, also in the past known as Dividend Achievers are a lists of companies with a history of increasing dividend payouts.To qualify as a Dividend Achiever, a company must have increased its dividend payout each year for the last 10 or more consecutive years and meet certain liquidity requirements. 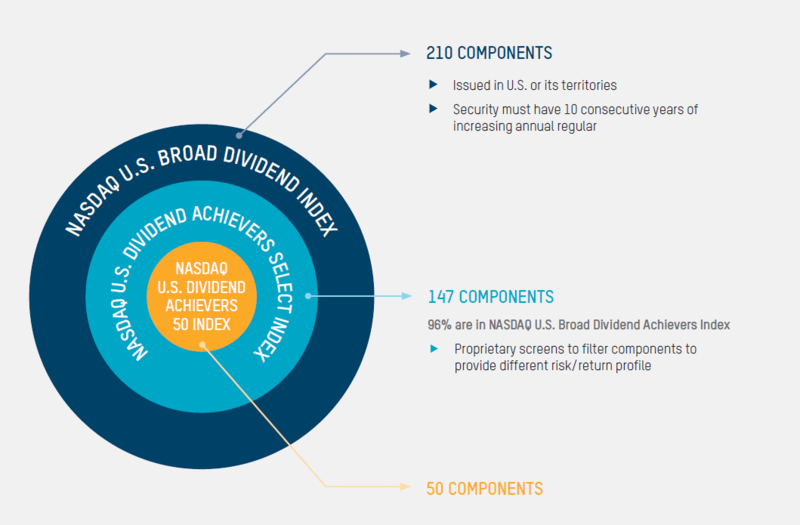 The focus of the Nasdaq Dividend Achievers™, is mainly US, Canada and the UK. The Nasdaq Dividend Achievers™ come in several variations and are often made invest-able by ETF’s providers like Invesco, allowing an investor to track this index. The Dividend Achievers™ history traces back to 1979 when Moody’s Investor Service developed this concept, eventually Nasdaq acquired the brand in late 2012 and added rules-based methodologies to make the indexes more transparent for investors. The Dividend Achievers Excel spreadsheet contains the following fundamental and stock price performance metric for each stock in the Nasdaq Dividend Achievers 50 index . The list of all Nasdaq Dividend Achievers could be a good starting point for dividend investors, since it gives you a concise list of all Nasdaq stocks with 10+ consecutive years of dividend increases. Similar to the Dividend Champions/Contenders/Challengers (CCC) list. Since the Nasdaq Dividend Achievers complete list contains more than 200 components, we focused on providing the Nasdaq Dividend Achievers 50 list in excel format with relevant data such as dividend yield and Pay-out ratio. This Dividend Achievers 50 spreadsheet allows you to easily sort by price-to-earnings ratio (or dividend yield) so you can quickly find undervalued or overvalued dividend paying stocks with 10+ years of consecutive dividend increases. Pay-out ratio’s above 80% should also be a warning signal for dividend investors. The Dividend Achievers full index list tend to underperform the S&P 500 TR. 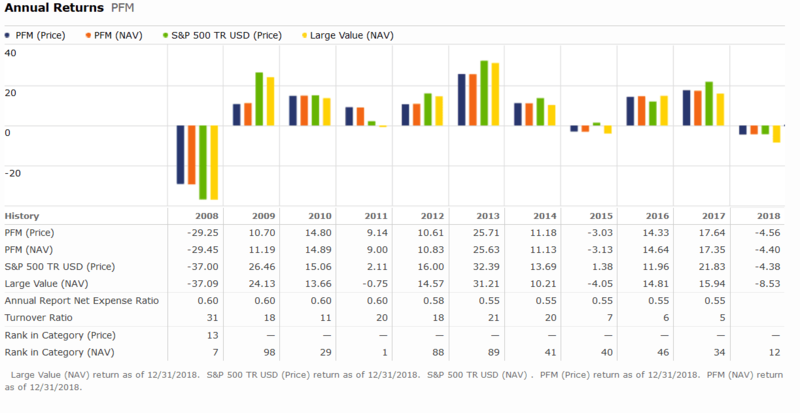 See chart and table below shows how the Dividend Achievers and the S&P 500 (TR) performed over the period 2008-2018. Please keep in mind that the Dividend Aristocrats tend to outperform the S&P 500 (TR). One of the reasons for the underperformance could be the difference in dividend history between the Dividend Aristocrats and the Dividend Achievers. The Dividend Aristocrats with 25 years of consecutive dividend increases covers multiple economic cycles. Dividend Achievers with 10 years do not have the same level of consistency as Dividend Aristocrats. 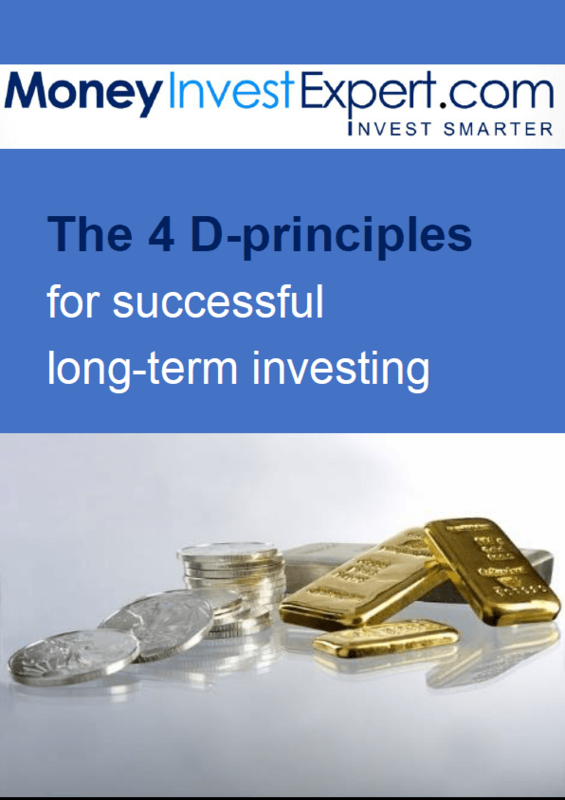 Dividends help identify well-managed companies; every dividend declaration represents a promise by management and a vote of confidence by the board of directors in the company’s leadership.